Large Collection of Items – First and Second "Maccabiah" / "Maccabi"
46 items related to the first and second "Maccabiah" competitions (1932, 1935) in Palestine, as well as to other "Maccabi" sports competitions in Palestine and abroad. Tel-Aviv and elsewhere, late 1920s-30s. 32 postcards, photographs and Real Photo postcards. Among the items: • Postcard with a photograph of the first "Maccabiah" opening ceremony (1932). • Real Photo postcard depicting a high jump competition in the first "Maccabiah" and other postcards with photographs from the first "Maccabiah". • Four postcards issued by the JNF (with photographs by Zoltan Kluger) printed for the second "Maccabiah". 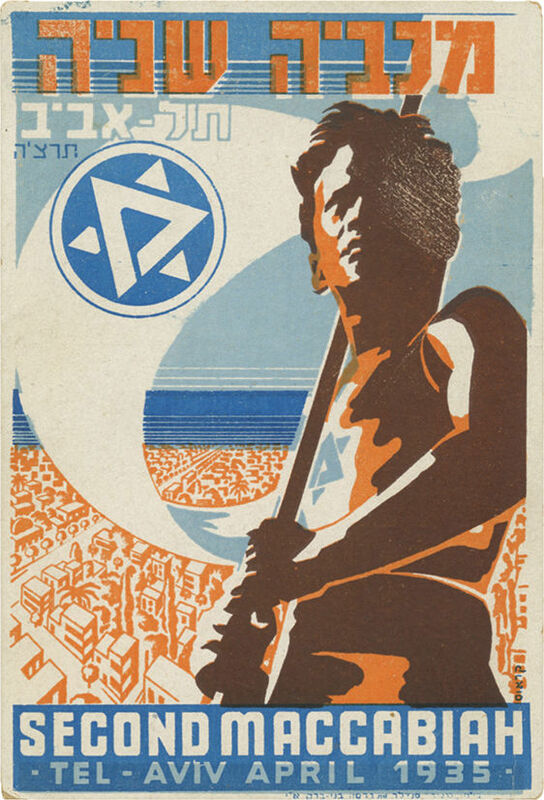 • Official postcard of the second "Maccabiah" designed by Franz Kraus. • Sixteen Real Photo postcards from the second "Maccabiah" (1935): opening ceremony, the sports field, a motorcycle spectacle, sportsmen from different countries marching on the field. • Other items. 14 printed items and pins. Among them: • circular letters no. 1, no. 18 and no. 20 of "'Maccabiah' News" - an information leaflet published towards and during the first "Maccabiah". • "Why we do not participate in the Maccabiah", a manifest issued by the "HaPoel Center", explaining the reasons why their groups do not participate in the first "Maccabiah". • "Maccabiah 1932" - a booklet with short essays and information about the "Maccabiah". • An appeal to women in Tel-Aviv to host in their homes guests who came for the first "Maccabiah". • Participant card - First "Maccabiah". • Participant card - Second "Maccabiah". • Entrance ticket to the Second "Maccabiah" closing ceremony. • Silver pin of the second "Maccabiah". • More items.